WOW! Hurry and print out this great high value coupon! 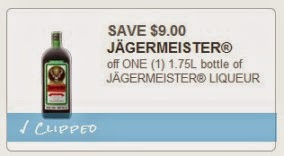 Right now you can get a $9/1 Jagermeister Liqueur 1.75 L Bottle Coupon! This coupon is perfect for the upcoming holiday season. Plus it is valid through 12/31/13 and only in AK, AZ, CA, CO, DC, DE, FL, IA, KS, KY, MI, MT, NV, NM, WI, WY. If you can't find it use zip code 88905.